E. M. Levesque > News > Discovery of a Thorne-Żytkow object candidate in the SMC! My collaborators and I have discovered a candidate Thorne-Żytkow object in the Small Magellanic Cloud! 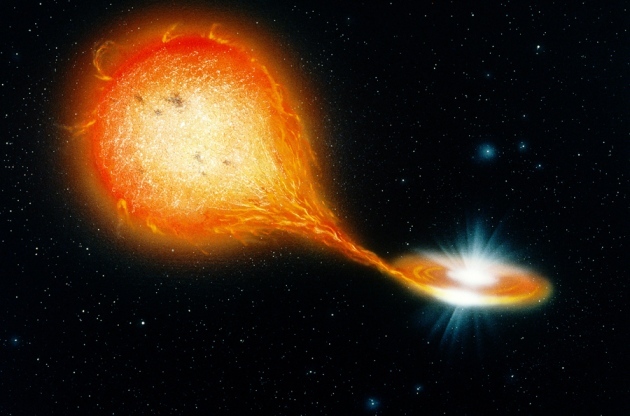 TŻOs are a class of object with a neutron star for a core, surrounded by a large diffuse atmosphere that makes them outwardly resemble massive red supergiants – definitely candidates for “the weirdest stars in the universe”, as they’ve been called! According to the most recent models, the only telltale sign that there’s a neutron star in there is a suite of element enhancements (including Li, Rb, and Mo) that, as a group, are uniquely attributable to the processes inside these exotic interiors. Written with co-authors Phil Massey (Lowell Observatory), Anna Żytkow (Cambridge University), and Nidia Morrell (Carnegie Observatories), our paper on our candidate TŻO has been accepted for publication in MNRAS Letters. The discovery received some early press back in January after a short presentation on our results at the AAS meeting, but now that it’s officially been peer-reviewed and accepted we can say a lot more about what we’ve found!